Your website should be “the place” to go for everything, saving everyone time and money. "I need a website platform that can hold up to the ever-changing demands on our website." You need a website that is fast, reliable, and available online everyday, but you don’t want to buy servers and software and have to hire a team to manage it all. You need a website that is backed up everyday, and can be restored at the drop of a hat in case something bad happens - and unfortunately it does. You need a website that is secure so that hackers and even those without bad intentions can’t access information they shouldn’t. You need a website platform that is scalable and will grow with your organization so you don’t have to start over down the road. 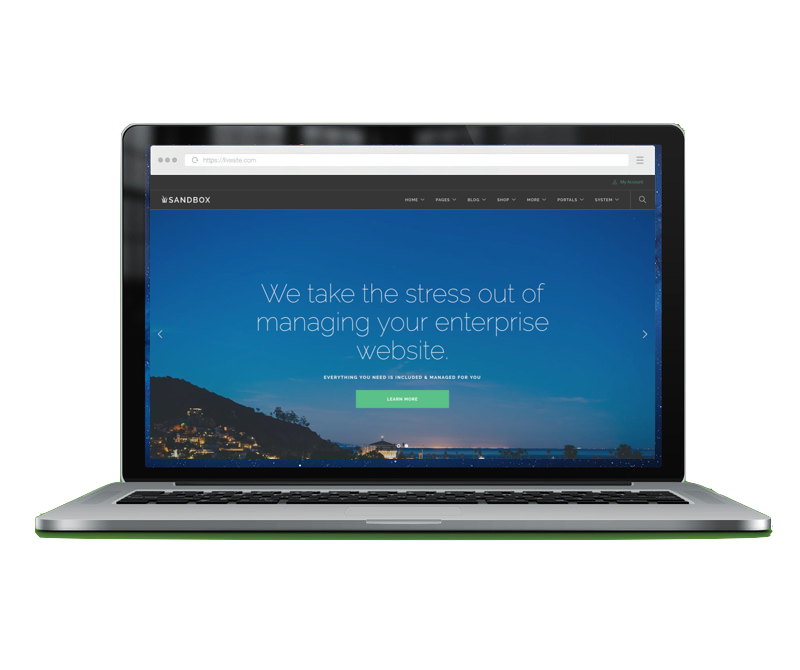 You need a website platform that is ready to go, backed by a team of Web Architects with a proven approach, so you don’t have to run the risk of the project going sideways and costing you a fortune. And you need a great partner. One that has over 20 years of experience doing this. One who is not on your payroll, but ready to jump in and provide expertise along the way to help your staff get the most out of your website and keeping it running smoothly. "I focus on the value our website platform provides. For me, a website must be more than pretty pages. It must improve my top line and my bottom line." You need a website platform that doesn’t charge you ‘per seat’ like most enterprise website platforms do so you are free to create unlimited user accounts and portals for your visitors, board, staff, clients, customers, members, donors, volunteers, or any other group that might need to interact or transact through your website. You need a website platform that is all-inclusive, and doesn’t charge for additional ‘modules’, so when you are ready to expand your website features and capabilities, you aren’t surprised with a bigger bill. You use terms like ‘Total Cost of Ownership’ and we get it. You need an integrated website platform that does it all, so you don’t have to hassle with multiple vendors and the additional time and expense that comes with cobbling solutions together. You need a website platform that doesn’t require purchasing additional desktop software for each member of your staff in order to manage it. "I am consumed with how our organization is perceived and how well our website presence conveys it. A great user experience is the key ingredient to our online marketing success." You need a website platform that doesn’t rely on rigid design constraints so your website design can be as beautifully-unique as you are. You need a website platform where the best user experiences have already been ‘baked-in’ from years of relentless user interface design improvements so you don’t waste time reinventing the wheel. You need an integrated website platform in which all the functionality is carefully crafted to work together, providing a smooth and seamless flow for all your users across all online interactions. You need a website platform that comes complete with it’s own built-in user engagement tools for content navigation, search, notification, and social media, so you can strengthen relationships both online and off. You need a website platform that is capable of automating your outbound e-mail campaigns all sharing the same website design to reinforce your brand. A platform that is smart enough to blast a message to thousands at a specific time, or trigger thousands of drip-campaigns to single recipients just in time. You need a website platform that has all the latest SEO features built in, so all you have to do is add content and your prospects will find you. And you need a website platform that has blogging features, but isn’t just a blogging platform that has been extended with plugins to be something it was never designed to be. "We need to login to our own personalized view of features we have access to, without the complexity and clutter associated with website solutions that were designed to be managed by a single administrator." You need a website platform that was designed with the flexibility to delegate and control access to specific areas of the same main website, empowering each leader and members of their team with their own slice of the main website to populate and manage. You need a website platform where you don’t have to worry about accidentally breaking the website because you had access to code areas and accidentally deleted something. You need a website platform that includes a full-featured CMS so you can easily create web pages and add copy and photos without worrying about messing up the web page layout or design. You need a website platform that doesn’t require you to be at your desk when inspiration strikes. Updating content and editing photos happens right on the web page, without any other software, so you're free to do your creative writing from anywhere, at any time, on your favorite mobile device. You need a website platform that includes Web Form features so you can create your own event registration forms, surveys, and view the results without the need to bother your web designer. You need to a website platform that includes Calendaring & Scheduling features so you can control your own area calendar and resolve scheduling conflicts. You need a website platform that includes Contact & E-mail Campaign features so you can manage your own contacts and organize them into your own mailing lists. You need a website platform where you can have your own personalized blog, all within your main website design and navigation. "My main concern is selecting the best website platform for my organization. One that I can trust to be flexible, scalable, secure, reliable, and hassle-free so I can sleep at night." You need a website platform that includes features to import your old website’s content and files instantly, to speed up the transition from your current website to your new one. You need a website platform that allows you to quickly and easily create portals, blogs, forums, order forms, and even complete storefronts and then delegate functionality or restrict access to anyone including staff teams, members, clients, or any other group that pops up with a need. You need a website platform that is hacker-proof, designed and built by a professional company with corporate enterprise security experience and not an unvetted community of open-source volunteer programmers. You need a website platform where all the software modules are designed and integrated together so your mission-critical website gets new features and fixes seamlessly and continuously - without downtime. You need a website platform partner that is responsible for managing the day-to-day duties for you, so you don’t have to deal with networking, firewalls, enterprise server software & hardware, database servers, broadcast e-mail servers, PCI compliance, SSL certificates, monitoring, backups, and restoring lost data. You need a website platform partner that is there to support you when you need it, and can customize the software for your specific needs, if necessary, and even include video tutorials to show you how the customized features. "I need a website platform build for front-end designers, free from design limitations, and with features to speed up the process of turning my designs into fully-functioning websites." You need a back-end website platform happy to accept your favorite responsive front--end framework including Bootstrap, Foundation, your own hand-coded designs, or any other HTML/CSS/JS framework. You need a website platform that will import all your digital assets and convert them into working pages, so you can quickly import an existing website design or third-party site template, saving you countless hours. You need a website platform that can handle unlimited custom designs and layouts within the same website, so you can create different themes for single page e-mail templates or across specific portals areas within your website. You need a website platform with built-in code editors and instant image compression and manipulation, all within your web browser so no other desktop software is required. You need a website platform that doesn’t rely on the outdated practice of FTPing files back and forth to make updates so you can tweak your designs from any mobile device while you are on the go. You need a website platform that protects your front-end design assets and code from access by other users, so that you don’t have to worry about someone without experience tinkering with your code and causing you some sleepless nights. You need a website platform that doesn’t require a separate development site when you need to overhaul the website or test site-wide changes. Imagine running multiple front-end designs on production pages for true testing and launching them with a single click when they are just right.